There are places in this big beautiful world of ours that look like they were created as CGI set for a movie about other worlds or of a time long forgotten. 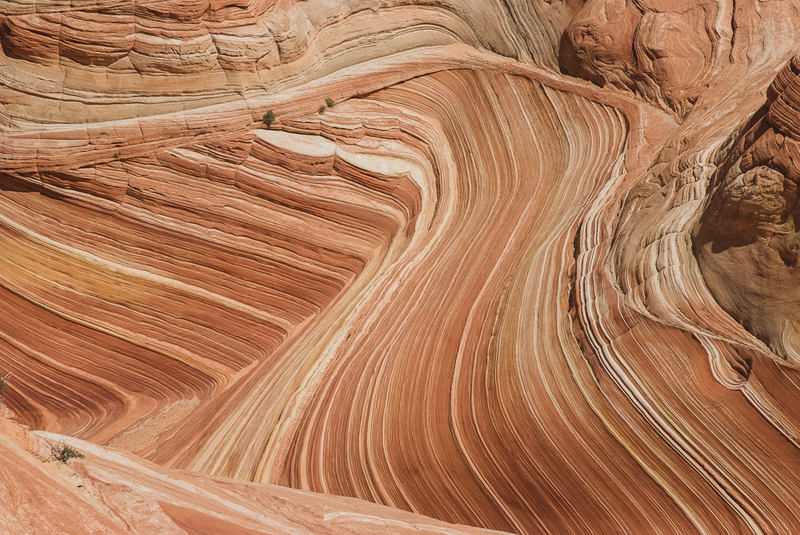 The Wave, a natural sandstone formation from the Jurassic age, falls into this category. 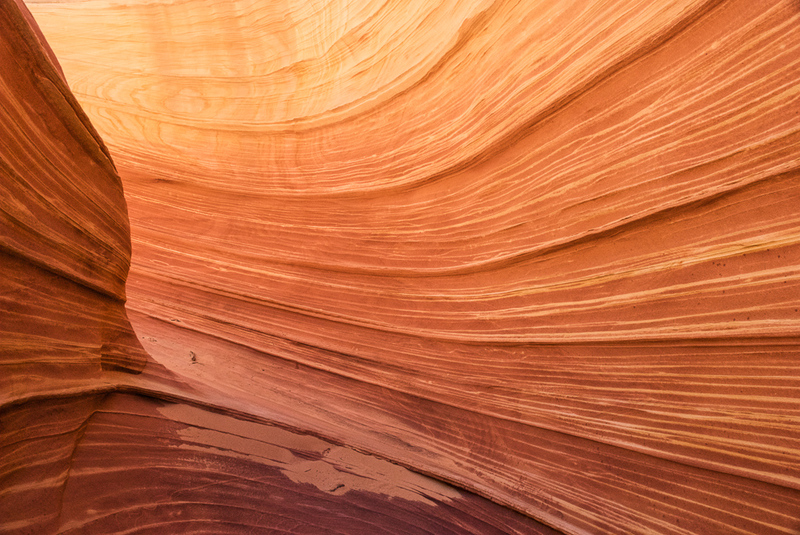 Although it was created slowly over time by wind and water eroding at the sandstone, you can easily mistake it as something that was sculptured deliberately. My friend, Pete and I tackled this hike on our road trip through the Southwest. 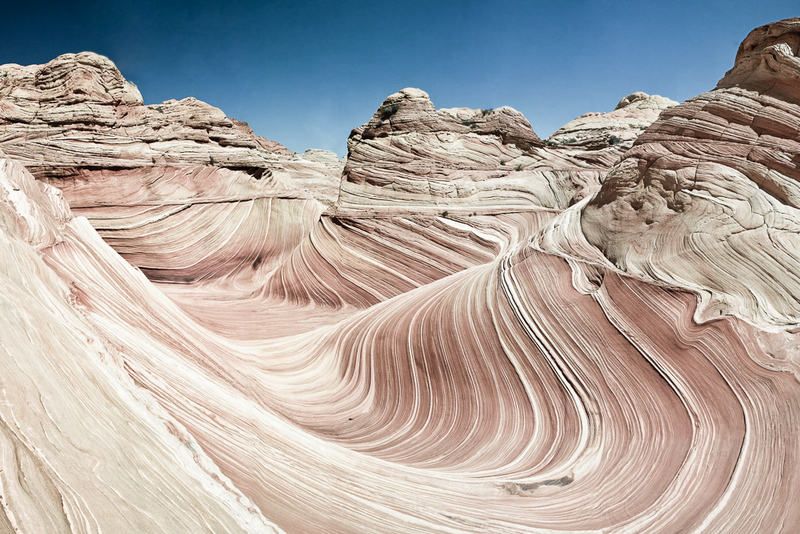 We’d heard about accessing the Wave via an alternative trail that from the south end of the Coyotes Buttes. It sounded like an adventure. We just didn’t know it would require us to duck some some barbed wires and walk through a field of thorny bushes to start the hike. On the afternoon before our hike, we decided to scout the Notch to see what we would be up against. With no directions, we looked up at the canyons and aimed for what we thought looked like a notched opening. This took a few minutes while we debated over what a notch looks like. We eventually settled on just guessing and looking for an opening that would allow us to eventually descend into the valley. About half an hour into the hike, the sun was dropping fast so that even if we made it over the notch, we wouldn’t have much light for our hike to the Wave and back out. We were happy with our progress and turned back to make camp for the night. The next morning, we once again ducked under the barbed wires, winced our way through thorn bushes and quickly made it back to where we had previously stopped. From here, the “trail” became harder to find with the path occasionally splitting off in different directions. Sometimes, we would have to split up and scout ahead for a minute and then turn back to decide on which way to proceed. Other times, we found cairns on the path that indicated we were heading the right way. 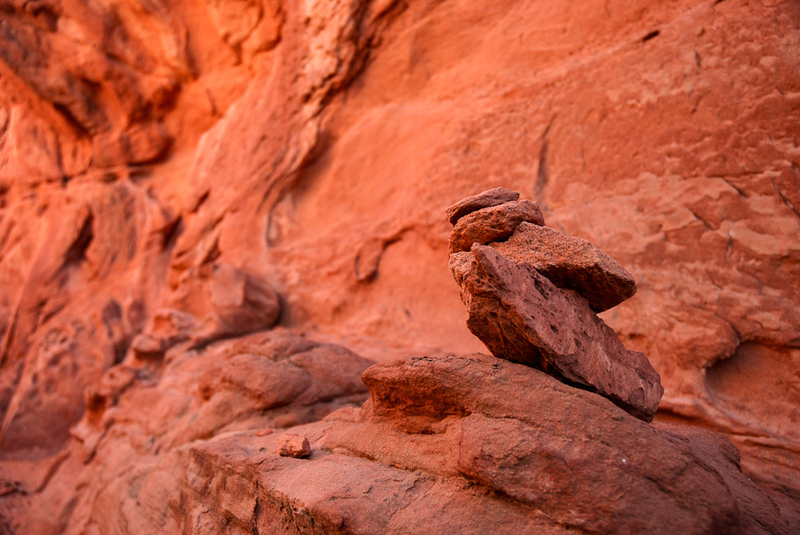 These stacked rocks are often left behind by experience hikers, almost like a crumb trail, to indicate direction. So we hoped. 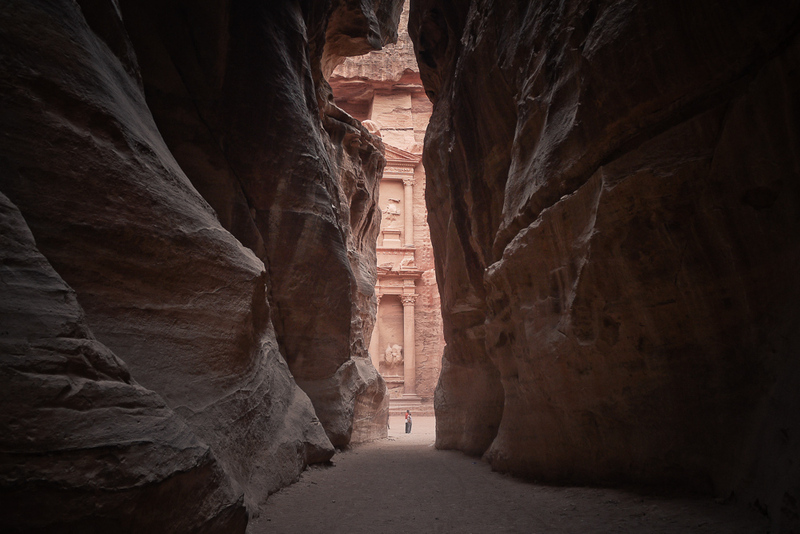 Our destination was the Wave, but the journey up the side of the jagged cliffs and through the sandstone canyons was just as beautiful. Eventually, we did find the “notch”. From this high vantage point, we matched the landscape to a simple map and descended the steep and sandy path down to the valley. It was all prehistoric at the point and I could almost see giant lizards waiting for us behind some of the bigger rocks. Our strategy was to cross the rocky terrain back up to higher grounds and walk along the ridges northbound until we either saw the wave or ran into other hikers. But first Pete had to take care of some business. The strategy paid off and we found the Wave in no time. It was a stunning sight to behold and I was glad that they only allowed a limited number of people in each day. It assured that the people who applied for the lottery months in advance really wanted to come here and would understand the importance of treading light to preserve the delicate formations. I could easily see the place completely destroyed if tourist buses brought hundreds of people here to trample all over this natural work of art. Standing in the narrow troughs of the Wave, it feels like you are in a frozen ocean of fiery waves. 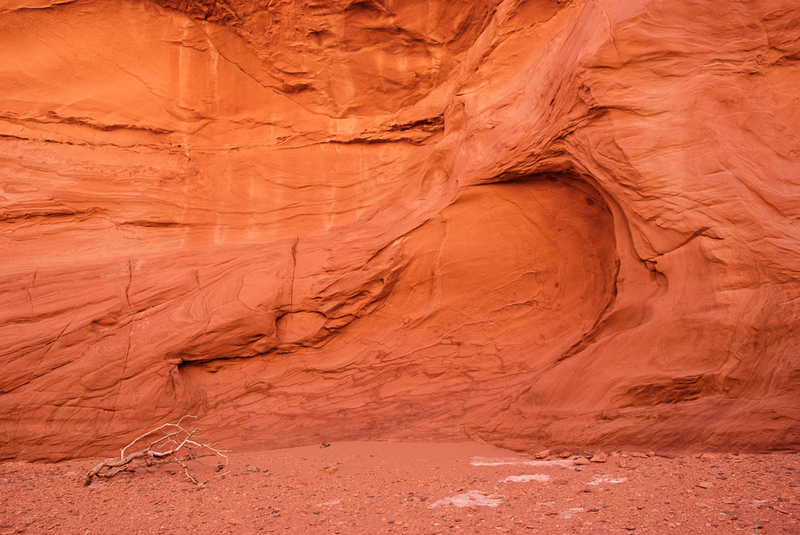 When the sun passes over and cast a shadow over the sandstone, the colors really come to life. 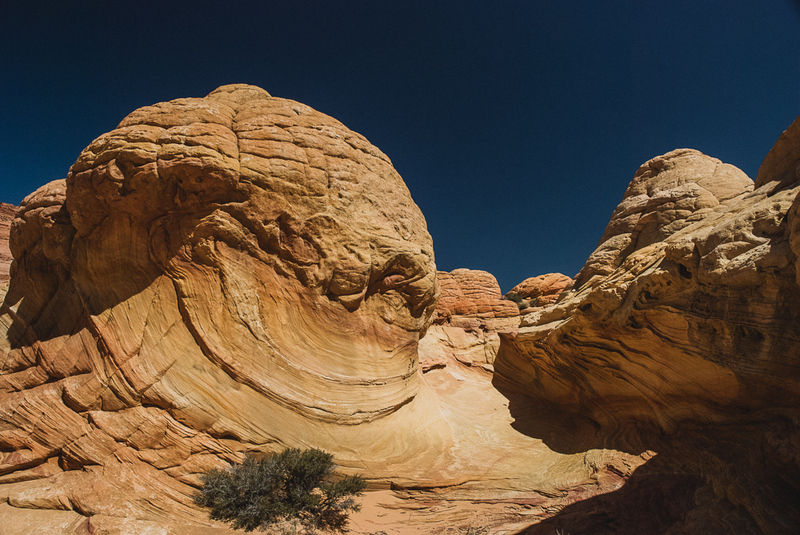 Beyond just the Wave, we explored another area called the Wave II and further on found a set bulbous protrusions with sandstone rocks that looks exactly brains. There was so much to see and we felt incredibly grateful to have most of the place to ourselves as the few other hikers started making their way back via to the Wire Pass Trailhead. 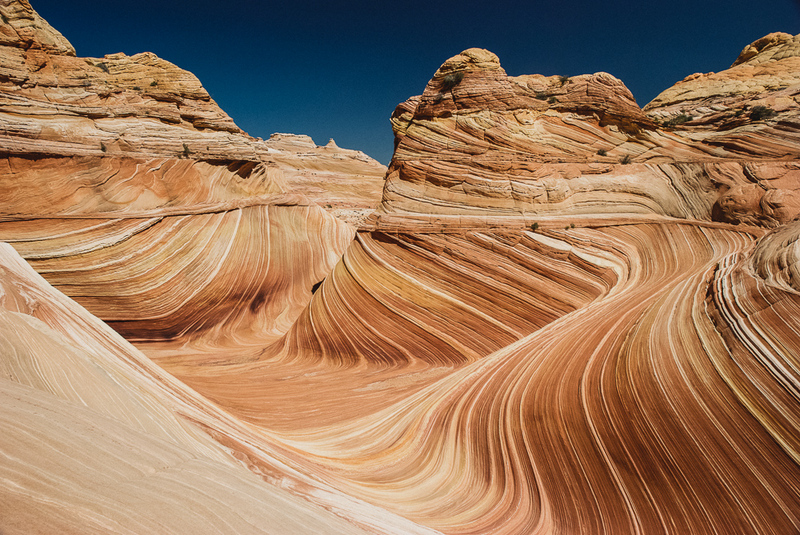 I put the Wave as one of the top places to visit for natural formations, but what makes it even more special was how difficult it is to get there. It requires both planning ahead and a bit of luck. If you’re determined enough, you will be rewarded. 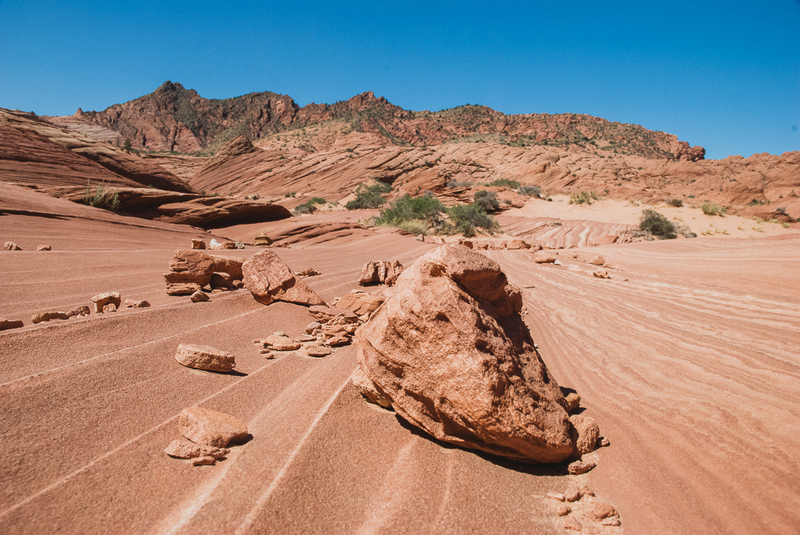 To limit the impact on the fragile sandstone and ridges, the Bureau of Land Management limits the numbers visitors to 20 a day. I don’t need to tell you that 20 is a pretty low number. 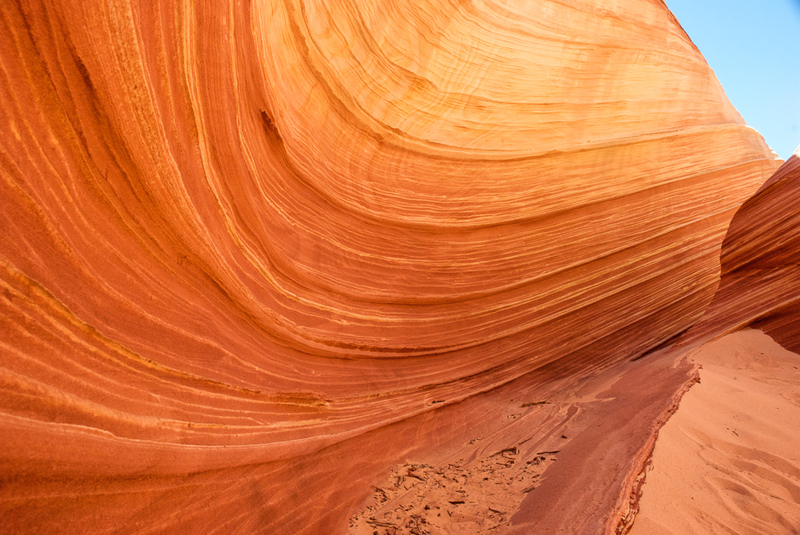 10 of those day use permits are available via lottery 4 months in advance with the other 10 offered via a 9 am in person lottery at the Grand Staircase-Escalante National Monument Visitor Center in Kanab, Utah for next-day access. Important Tip: If you are coming from Arizona, be aware that since the state does not observe Daylight Savings Time, it is one hour behind Utah from the second Sunday in March to the first Sunday in November. I learned this the hard way. 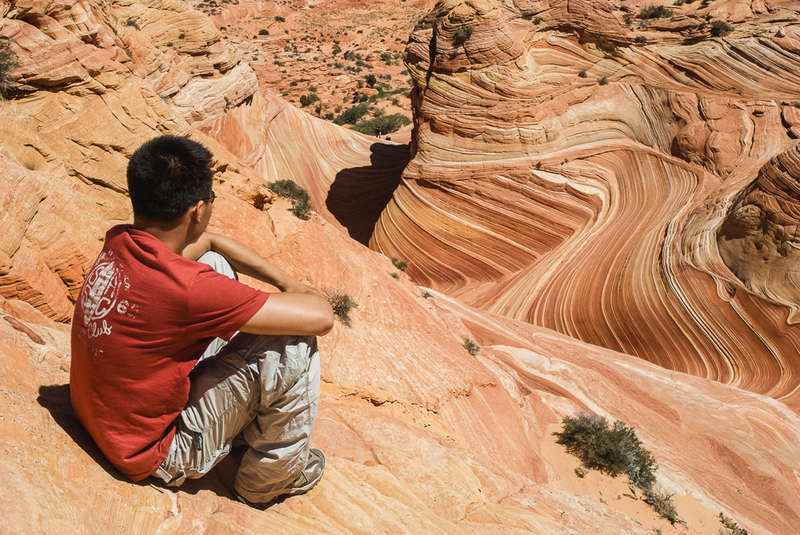 To preserve the natural features of the Paria Canyon-Vermillion Cliffs Wilderness, there are no real trails to get to the Wave itself. 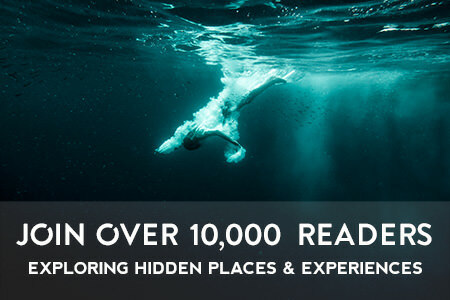 This makes finding this hidden area even more challenging and many people have been lost trying to find it. Armed with a GPS, you can punch in the coordinates: 36°59′45.84″N 112°00′21.9″W. 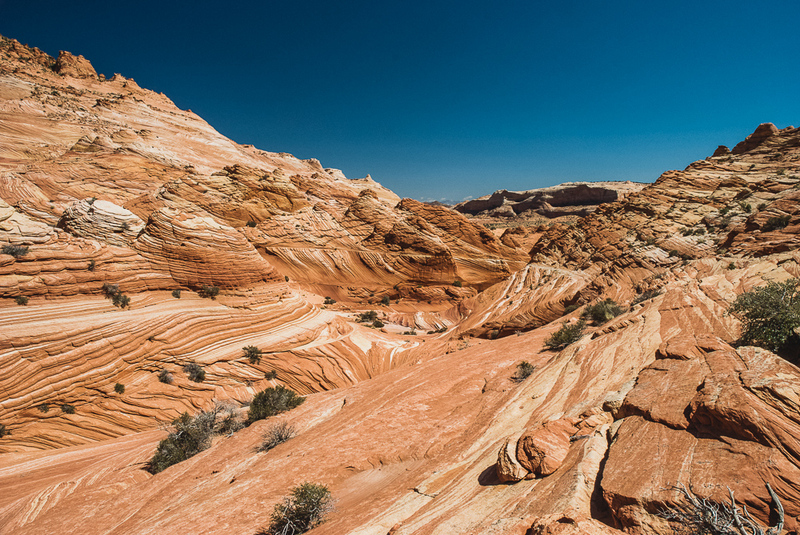 Along with a permit, hikers are now provided with a guide sheet showing 6 visual checkpoints starting at the Wire Pass Trailhead and leading to a landmark known as the “Black Crack” that opens to the Wave formations. This route is about 6 miles roundtrip and will take about 4-6 hours. Important Tip: Don’t take the navigation lightly. During the summer months, the high temperatures can be dangerous and fatal for unprepared and lost hikers. There is no real shade coverage from the exposure or available water source. Alternatively, hikers can also access the Wave from the Notch trailhead southwest from the Wave. Drive another 2 miles south past the Wire Pass Trailhead and look for a metal tanker to the side of the road. 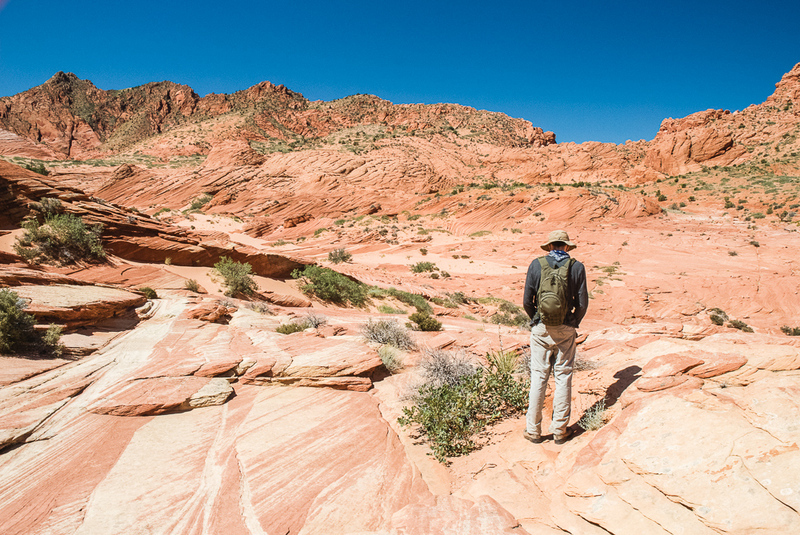 This is a much more difficult one that requires solid backcountry navigation skills across a variety of uneven terrain and a steep climb up to the cliffs that surround the area. Once you’ve access the notch opening at the top of the mountain, you can visually identify the general area of the Wave from higher grounds. Descend the sandy drop and reestablish high ground on the east side of the cliffs before heading north towards the Wave. This route is about 5 miles roundtrip and will take about 4-6 hours. Important Tip: Bring extra water and snacks. Stay hydrated, especially when the temperatures are high. You may end up taking longer to get to the Wave and you’ll want to spend a bit of time exploring. 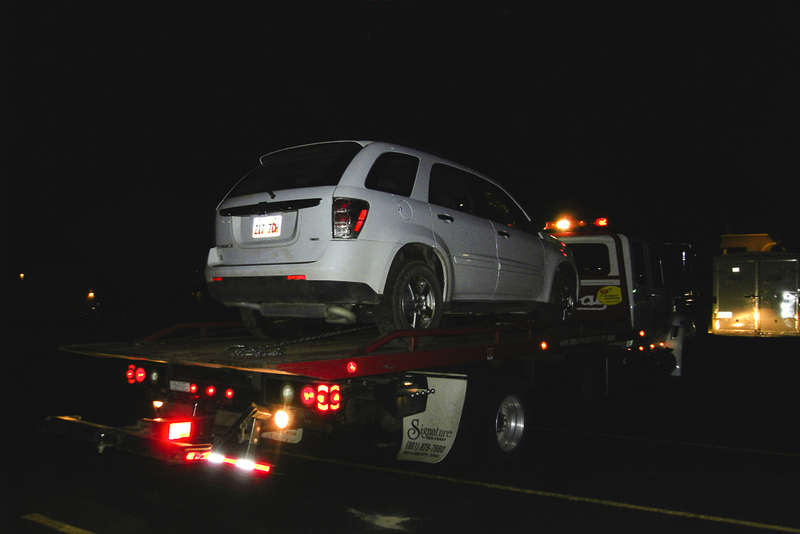 A few minutes later, our car stopped running and we were stuck halfway between Kanab and Page trying to hitch a ride on the side of the road. A good way to close out our trip.